David Alfaro Siqueiros was a Mexican social realist painter, better known for his large murals in fresco. Along with Diego Rivera and José Clemente Orozco, he established "Mexican Muralism." He was a Stalinist in support of the Soviet Union and a member of the Mexican Communist Party who led an unsuccessful attempt to assassinate Leon Trotsky in May 1940. José Clemente Orozco was a Mexican caricaturist and painter, who specialized in political murals that established the Mexican Mural Renaissance together with murals by Diego Rivera, David Alfaro Siqueiros, and others. Orozco was the most complex of the Mexican muralists, fond of the theme of human suffering, but less realistic and more fascinated by machines than Rivera. Mostly influenced by Symbolism, he was also a genre painter and lithographer. 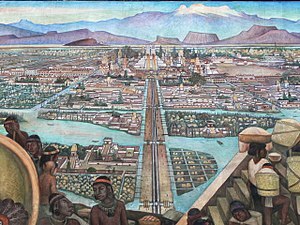 Between 1922 and 1948, Orozco painted murals in Mexico City, Orizaba, Claremont, California, New York City, Hanover, New Hampshire, Guadalajara, Jalisco, and Jiquilpan, Michoacán. His drawings and paintings are exhibited by the Carrillo Gil Museum in Mexico City, and the Orozco Workshop-Museum in Guadalajara. Orozco was known for being a politically committed artist and promoted the political causes of peasants and workers. Gerardo Murillo Cornado was a Mexican painter and writer who signed his works "Dr. Atl". Louis Henri Jean Charlot was a French and naturalized American painter and illustrator, active mainly in Mexico and the United States. Roberto Montenegro Nervo was a painter, muralist and illustrator, who was one of the first to be involved in the Mexican muralism movement after the Mexican Revolution. His most important mural work was done at the former San Pedro and San Pablo monastery but as his work did not have the same drama as other muralists, such as Diego Rivera, he lost prominence in this endeavor. Most of his career is dedicated to illustration and publishing, portrait painting and the promotion of Mexican handcrafts and folk art. San Ildefonso College currently is a museum and cultural center in Mexico City, considered to be the birthplace of the Mexican muralism movement. San Ildefonso began as a prestigious Jesuit boarding school, and after the Reform War it gained educational prestige again as National Preparatory School. This school and the building closed completely in 1978, then reopened as a museum and cultural center in 1992. The museum has permanent and temporary art and archeological exhibitions in addition to the many murals painted on its walls by José Clemente Orozco, Fernando Leal, Diego Rivera and others. The complex is located between San Ildefonso Street and Justo Sierra Street in the historic center of Mexico City. Ramón Alva de la Canal was a Mexican painter, illustrator, and educator, one of the pioneers of the Mexican muralism movement. Fernando Leal was one of the first painters to participate in the Mexican muralism movement starting in the 1920s. After seeing one of his paintings, Secretary of Education José Vasconcelos invited Leal to paint at the Escuela Nacional Preparatoria. The resulting work is Los danzantes de Chalma. Leal also painted a mural dedicated to Simón Bolívar at the Anfiteatro Bolivar, as well as religious murals such as those at the chapel dedicated to the Virgin of Guadalupe at the Basilica Villa in Tepeyac. Generación de la Ruptura is the name given by art critic Teresa del Conde to the generation of Mexican artists against the established Mexican School of Painting, more commonly called Mexican muralism post World War II. It began with the criticisms of José Luis Cuevas in the early 1950s, followed by others who thought the established art had become dogmatic, formulaic and nationalistic and the artists too deferential to the government. This new generation of artists was not bound by a particular artistic style but was more interested in personal rather than social issues and influenced by a number of international trends in art such as Abstract expressionism. Early reaction to them was strong and negative but by the end of the 1950s, they had succeeded in having their art shown in the major venues of Mexico. The Generación de la Ruptura had influence on other arts in Mexico, such as literature but it did not end the production of murals in Mexico with social and nationalist purposes. Mario Orozco Rivera was a Mexican muralist and painter, a later proponent of Mexican muralism, and whose work was particularly influenced by David Alfaro Siqueiros. He created a number of murals, mostly in the state of Veracruz before becoming an assistant to Siqueiros, directing the Taller Siqueiros in Cuernavaca and working with the artists on projects such as the Polyforum Cultural Siqueiros. While preferring mural work, which he considered less commercial, Orozco Rivera also created oils and sculptures. Many of these works were exhibited in Mexico and abroad and can be found in many major collections. His work received recognition in various countries. The History of Mexico mural in the stairwell of the National Palace in Mexico City was executed between 1929 and 1935 by Diego Rivera. The subject of the mural is Mexico's history from ancient times to the present. They depict the many struggles of the common Mexican people to fight against the Spanish, the French, and the dictators that controlled the country at different points in its history. Zapata (1932) is a lithograph by the Mexican artist Diego Rivera (1886–1957) that depicts the Mexican revolutionary Emiliano Zapata (1879–1919) as he holds the reins of a horse among a group of campesinos (peasants). The lithographic edition was created and printed twelve years after Zapata's assassination. Zapata is based on Agrarian Leader Zapata (1931), one of eight "portable" frescoes produced explicitly for Rivera's solo exhibition at the Museum of Modern Art (MoMA) in 1931, which was adapted from his previous Revolt panel from a fresco titled The History of Cuernavaca and Morelos (1929–30) painted in the Palace of Cortés, Cuernavaca. There were 100 original prints of the lithograph, many of which are in the collections of various art museums. 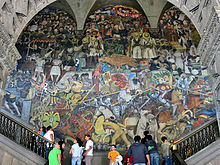 History of Morelos, Conquest and Revolution (1929-1930) was a fresco painted by Mexican artist Diego Rivera in Cuernavaca's [[Palace of Cortés, Cuernavaca]Palace of Cortés]]. The piece was commissioned by Dwight Morrow, U.S. Ambassador to Mexico at the time.